EspañolThis year marks the 25th anniversary of the fall of the Berlin Wall, an event that symbolically marked the beginning of a new political and social era, while also signaling the “end of history,” in the words of Francis Fukuyama. When Fukuyama announced that history was coming to an end in 1992, he was celebrating the culmination of political and social progress understood as the imminence and universal legitimacy of the liberal democratic model, “the end point of mankind’s ideological evolution,” and the exhaustion of all other viable alternatives to liberalism — Bolshevism, Fascism, Nazism, and Marxism, which characterized much of the 20th century. 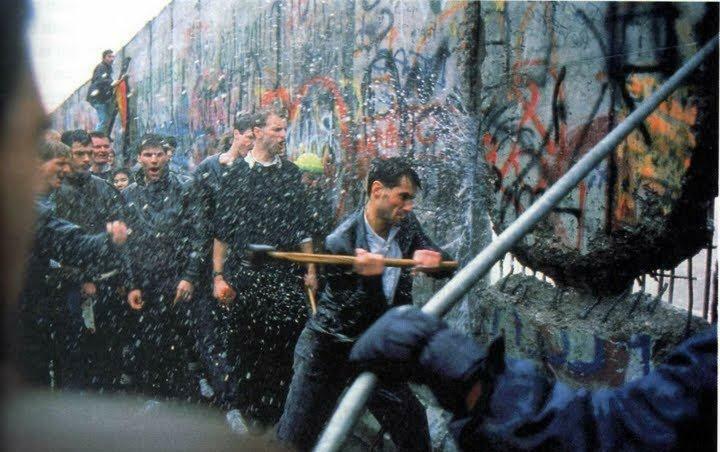 We destroy The Wall … but others continue to be built. Source: krtoonsnacks.com. The end of the Cold War brought celebrations over the beginning of a new political era of openness. After the fall of the Berlin Wall and the intensification of unprecedented cross-border relations, many declared borders and territorial barriers obsolete; it seemed that the rigid body of Leviathan was being dismantled to make room for a global public awareness, extending beyond the rigid limits of territorial boundaries. However, given the events of the last few decades, it is clear that Fukuyama wrote of an end to history that never truly eventuated. Today, we are witnessing liberalism, democracy, and human freedom in danger once again. The spirit of authoritarianism has renewed the repression of social pluralism, the rise of state paternalism, the tyranny of the collective, and obstacles to individualism — all done in the name of security, social justice, or so-called “sovereign rights,” in a growing number of countries all over the world. The Berlin Wall may have fallen, but in its place government officials have erected dozens of new walls — concrete structures that define the contours of states. The term “Cold War” may have become obsolete over the years, but its end in no way translated to the end, or even the reduction, of security barriers between states. This manner of thinking involves an antiquated response to modern challenges. The modern leviathan swallows and consumes its subjects; it expels those that represent what the state arbitrarily defines as national security threats, or so-called “clandestine transnational actors” — among them are terrorists, but also, in large part, illegal immigrants. While post-Westphalian borders and boundaries have formally designated equal political units as sovereign, the new walls signify an alarming disproportion. They are built to repress the people, immigrants, and the poor who have been turned into “vagabonds” and have fled their homelands in search of a better life and, at times, just to survive. States that wall off their borders have turned their backs on humanity. Those that find themselves on the wrong side of the wall are then ontologically devoid of attributes like citizenship and nationality. The discrimination that prevails as a result of this return to anachronistic political solutions can be captured conceptually by the term for outsiders as “new barbarians” — not only “primitive” and “underdeveloped,” but also “radically foreign,” enemies, invaders ante portas (before the gates). The phenomenon of walling international borders foreshadows a new global political configuration, where these walls become a concrete sign of the frightening challenges to freedom and the underlying tensions between internal and external forces regarding sovereignty, citizenship, and humanity. There is an increasing risk of border walls becoming more than just isolated phenomena, and spreading throughout the world. Border walls are in effect violent physical constructs that are often accompanied by equally formidable political discourse. If and when the walls become legitimatized political tools internationally, the regrettable political and ethical consequences will be shared by both sides. This is especially alarming in the case of states and societies that believe themselves to be liberal and democratic. Many of these states that are now walling their borders to immigrants were in the past the authors and ambassadors of international human rights — declaring to all people, not just citizens, their inherent capacity for universal rights, regardless of nationality. The fact that it is possible to recognize the values of freedom and democracy, while at the same time give legitimacy to the “politics of walls,” is a sign of the dark times we are living in. Cherished concepts of freedom, democracy, and justice, whose triumph only 25 years ago we continue to celebrate, have been transformed and perverted by brutal influence — a message that echoes in fractured spaces, in the ears of people violated daily and globally by the tyranny of walls, obscured by the long shadows they cast.